More than 100 students counter-protested six Westboro Church members in 2009. The Westboro Baptist Church, an anti-LGBTQ religious group, has obtained a permit from the city of Chicago to protest at various locations near University buildings this Friday. A counter-protest has been organized on Facebook, but some students are urging people to ignore Westboro altogether. In the morning, the group will protest at Weiss Memorial Hospital in North Chicago over its stance on gender reassignment surgery for transgender men. The protesters will then move to the northern edge of the UChicago campus, at the intersection of East 55th Street and South University Avenue. After picketing there from 11:30 a.m. to noon, the group plans to move south to Woodlawn Avenue, across from the University of Chicago Law School, where it will stay until 12:35 p.m.
Members of the University community are organizing several events in response to the protest. A Facebook page started by several students from of the class of 2020 was organizing a counter protest as a demonstration of solidarity with transgender members of the University. The original event page has been taken down, but another counter-protest Facebook event has been created. The counter protesters will assemble near Campus North at 11:20 a.m. and follow the Church as it moves around campus. Moises Rodriguez, one of the original counter protest’s organizers, specified that the event was not intended to directly engage the Church through heckling or other opposition, but to send a message that the University supports transgender individuals and does not tolerate the Church’s prejudicial views. The Westboro Baptist Church, based in Topeka, KS, is a religious organization known for its anti-LGBTQ stance and protests at events such as the funerals of American soldiers and celebrities. The Church has directed attacks at religions including Islam, Hinduism, and other forms of Christianity, and has focused its protests on adultery, homosexuality, and gender reassignment, among other perceived sins. The Church is considered a hate group by several entities that monitor such organizations, including the Anti Defamation League and the Southern Poverty Law Center. The Church’s visit to UChicago is part of a series of protests nationwide at institutions its members perceive as supportive of transgender individuals. In its statement about the protest at the University, the Church cites what it considers to be transgender-friendly policies, such as gender neutral housing and bathrooms, as well as efforts by members of the Law School to promote LGBTQ-inclusive legal campaigns. An earlier version of this article said that Westboro Church obtained a permit to protest at various locations "on campus." This article has been updated to reflect that they did not protest on University property. 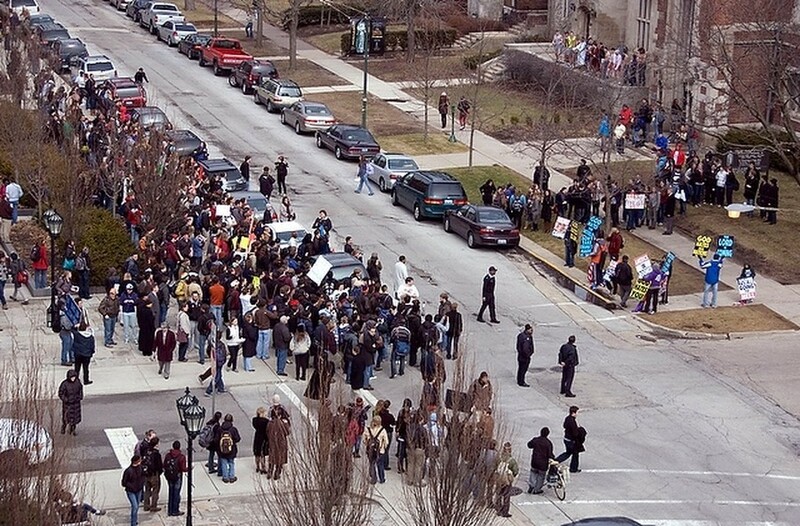 When Westboro came to campus in 2009, Alpha Delta Phi (Alpha Delt) staged a counterprotest.